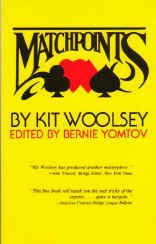 Kit Woolsey's Matchpoints is one of two books that I think all aspiring bridge experts need to have read. (The other is Lawrence's How To Read Your Opponents' Cards.) Woolsey does a masterful job of explaining the mathematics of matchpoints (don't worry - you don't need a calculator!) and tries to help the reader think about the right things, like what the contracts will be at the other tables, whether or not to take a safety play, and what the expected gain or loss would be from different lines of play. Woolsey spends a lot of time on the "two ways to win" principle, and for good reason! It's simple mathematics, but most bridge players don't quite 'get' that combining the chances of two unlikely things can add up to a better chance than one likely thing happening. The simplest case of combining chances is taking two finesses. Every bridge player should know that finding a 3-2 split (68%) is much more likely to happen than finding a finesse onside (50%). But if you can combine your chances on a hand and find one of two finesses onside, it adds up to 75%, considerably better than the chances for a 3-2 split. Woolsey goes into many different "combine your chances" situations in both the bidding and the play. To go along with the standard pairs subjects, like balancing, doubling, and sacrificing, he also has a good section on the Law of Total Tricks. In my opinion, Woolsey's discussion on the subject is more accurate and valuable than Larry Cohen's more famous work on the subject, To Bid or Not to Bid. Surprisingly, Matchpoints is a good way to learn IMP play for those of you who almost exlusively play pair games! The first time (of probably six or seven by now) I read this book, I had been coming along well at the bridge club. I'd placed highly in some Sectional pair games, but never seemed to do anything in the Sectional Swisses. Matchpoints made me realize just how many of the "pairs-only" tricks Woolsey shared that I was already doing, and how many imps they were costing me! So, in a nutshell, if you haven't read this book yet, get it before your next pair game!